When we got home from the Cancer Center yesterday, JJ immediately fell asleep and slept for several hours. After I got a few things done, I lay down too because I didn’t know how interrupted the night would be. JJ has been sleeping on the couch, EJ sleeps in his lazyboy, and I am sleeping on the loveseat so I can be near if JJ needs me–at least until we get used to this new life. It took me a while to fall asleep, and then JJ woke me because he was feeling a little nauseous. He has two anti-nausea medications–one to take every eight hours and the other to take if he still feels nauseous. I gave him the second one, which helped him a lot. By this time it was almost time for EJ to get home from work, so I figured I might as well stay up. We talked a bit and then it was close to the time JJ needed to take his anti-nausea medication, so I stayed up until 2 a.m. to give it to him. I fell asleep, but JJ woke me a few hours later because he was feeling nauseous so I gave him the second pill. I fell asleep again, and then it was time to get up for the day. We didn’t have to be at Chemo until 10:30 a.m. so the alarm went off at 8 a.m. However, a cat woke me up at 7:30 a.m. by knocking my phone off the table. Morning was spent getting dressed, doing dishes from the day before, getting a load of clothes in the washer (dance of joy about the new washer/dryer), checking our bags to see if they had everything we wanted to take with us, and taking Danny outside. We had to leave early because I needed to stop at the post office to pick up the mail and buy stamps. It was a very cold morning (6F degrees), so while EJ heated up the car, I called Danny to come inside. He was nowhere to be found. He had escaped out of the back fence that had been crushed when a storm blew a tree on it. I had blocked the opening, but Danny had figured out how to thwart it. We haven’t had time to repair it. With just minutes to spare before we had to leave for the Cancer Center, EJ and I hopped in the car and drove around looking for him. I had a good idea where he would go so I directed EJ there and, sure enough, that’s where he was. He hopped in the car and we took him home, loaded up JJ and our bags, went to the post office, and then we were off. JJ was put in a two person room this time, but he was the only patient in the room. I waited outside the room while the nurse hooked JJ up. I want the nurses to care for JJ and the other cancer patients rather than have to focus on me because I fainted or got sick. EJ told me that he explained to the nurse that I am very, very brave when it comes to suffering for myself, but I deeply feel the sufferings of others to such an extent that I get faint. I thanked him for describing me as a compassionate hero rather than a wimp. Once JJ was hooked up, I returned to the room. EJ’s company has been having meetings at various times for open enrollment for their insurance. With JJ being sick, EJ wanted to see if he could sign us up for the better insurance with lower co-pays and deductibles. 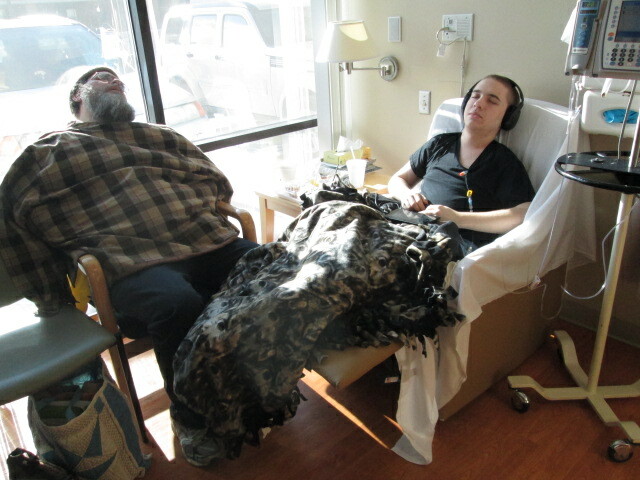 He could have gone to a 7 a.m. meeting and gotten back home in time to take us to the Cancer Center, but we just couldn’t endure another very early morning and rushing around. Instead, we decided that he would get us settled and then drive back to his company for a 2:15 p.m. meeting. He would get back to the hospital in plenty of time to drive us home. After JJ got settled in, he said that he was hungry, so I went with EJ to the cafeteria in order to learn the way. I get lost very, very easily, and I needed to be able to find the way to the cafeteria in case JJ needed food while EJ was gone. The way to the cafeteria is so easy that even I will be able to find it by myself. I think. EJ and I loaded up a tray of food for JJ and for ourselves, and returned to JJ’s room. JJ’s medication made him sleepy today, so he slept most of the five hours we were there. Since EJ had a few hours before his meeting at work, he also fell asleep in his chair. I am envious of my husband’s ability to cat nap anywhere, a skill that I do not have. EJ returned from his meeting at 3 p.m. We were on our way home by 4 p.m. The McDonald’s where JJ worked is on the way home, and he asked if we could stop in so he could get a shake and say “hi” to his co-workers. So we did. Everyone greeted him very warmly. Once we get home, there are things we have to get done. Today I put clean sheets and blanket on the couch for JJ and helped him settled him in, while EJ got the fire going in the wood stove. He fixed the gate so Danny couldn’t get out of the front yard and then let him out. I got food warming up for us and started doing more laundry. We made sure the pets were fed. EJ rested a bit, ate supper, and then he left for work. JJ fell asleep on the couch after his Dad left for work, so I lay down on the loveseat and slept too. I got the best sleep I’ve had in days. I told EJ today that when people told me that they or they or a loved one had cancer and was going through Chemo, I’d sympathize and ask how they were doing, and usually they’d reply “fine.” But I had no idea what was involved with Chemo or what the patients and families go through. I am amazed at how incredibly ignorant I was. Our spirits are remaining strong. We are taking one day at a time, doing what has to be done, and trusting God through all this. JJ is doing quite well through this, although the nurse told him that he might start feeling worse at the end of the week. At work, EJ learned that his co-worker friend was put in an induced coma. Her youngest son beat her up, and when his girlfriend tried to intervene, he beat up her too. EJ did not know how badly the girlfriend was hurt. EJ is distressed by this. I have no words to express my feelings about this. What a tough guy he is to beat up his mother and girlfriend so badly. EJ’s friend is at the hospital that we go to every day. She’s in ICU so we probably can’t get in to see her, but we discussed whether EJ could try to visit her family in the hospital tomorrow just to let them know he cares. We made it through a second day of Chemo. Tomorrow we don’t have to be at the hospital until 11 a.m. Thank you, Simone. I am so glad you are here. Thank you so much, Miss Lou!